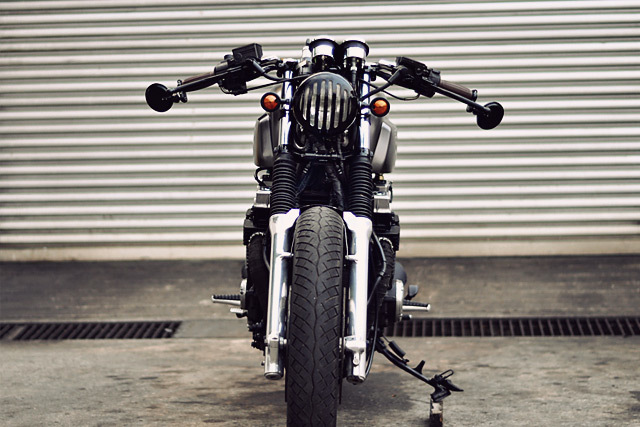 There are certain motorcycles of yesteryear that have failed to break through into the new custom culture; some for very good reasons, but others like the Honda CBX750 seem to have been over looked for no good reason at all, well no longer. 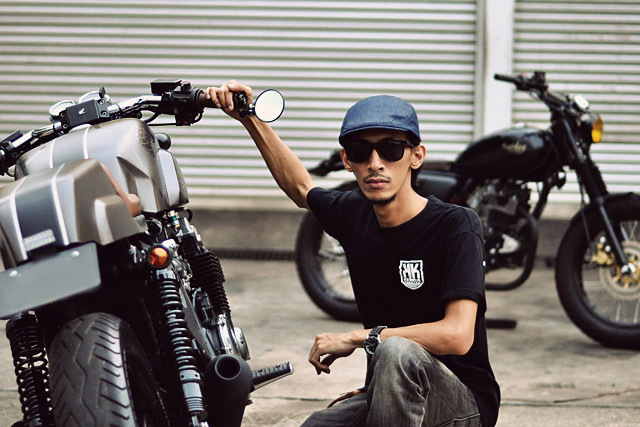 Kerkus Cycles from Kuala Lumpur have taken the popular police bike in Malaysia and turned out some amazing customs, this time around it’s a Classic Ducati inspired machine for a customer who loves his Hondas. 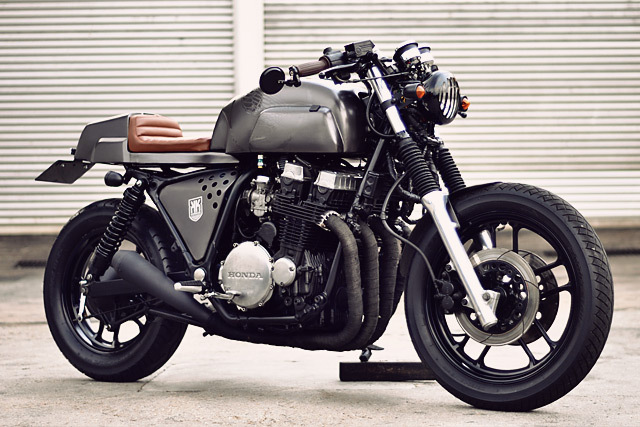 While the Honda CB750 has been a dominant force in motorcycle culture from the day of its launch right up to the many café customs that are showcased around the world today. Its older brother the CBX750 has been all but ignored, perhaps it’s instantly overlooked because of its very polarising looks, but many bikes that are popular today are no lookers in stock trim. Furthermore if you compare the CB to the CBX; both are 4 cylinder quad carb bikes, both are around the same weight and come with Honda reliability and plentiful parts supply. But the CBX actually has many benefits over the CB, 30bhp more, far superior frame and suspension and the P series police bikes even have a slipper clutch. And it’s a Police special that Kerkus picked to craft this custom machine, although it came without much of the overgrown fairings, the extra horns, wiring and sirens were present. They like a whole host of other parts like the standard instruments, gaudy headlight and signals have all been ditched to save a bunch of weight. To further improve the power to weight ratio the carbs were refreshed and the power sapping rear cans swapped out for a pair of shorty mufflers that sit on the end of a heat wrapped set of headers. 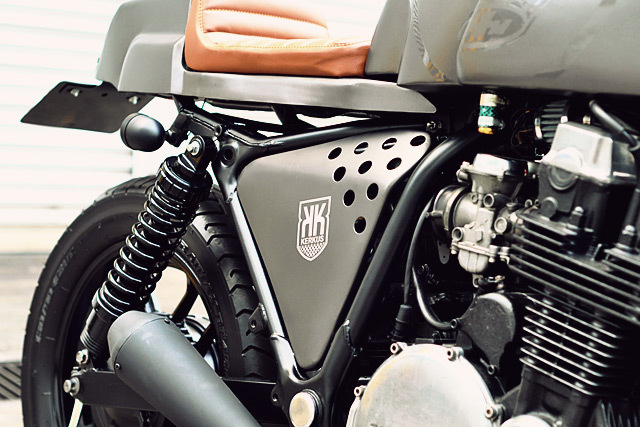 The owner of the bike is a big fan of the Ducati Sport 1000 and wanted a tank that was similar without being the same. It was a challenge that the Kerkus boys took on with open arms and the result is a classic look with an even more muscular presence. Like the Sport 1000 the tank extends its shoulders out wide but the rear of the tank is aggressively sculpted to allow the rider to tuck in. Not wanting to take away from the lines they created a slim tank cap that was CNC’d from Aluminium and looks the business. To match the muscular tank was always going to require a total rethinking of the rear end and the first step was to cut the subframe straight off. 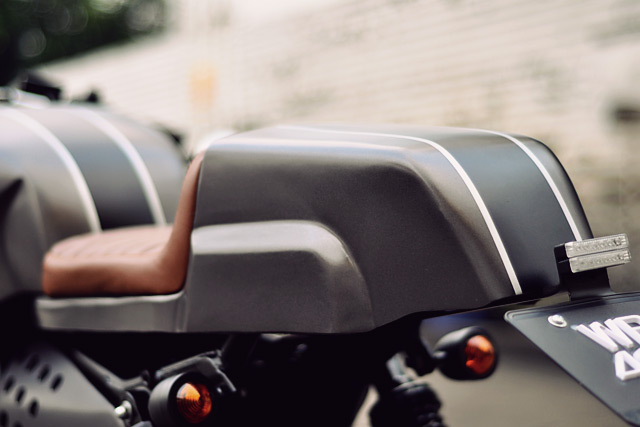 The seat is moulded to match the shapes of the tank and maintain a consistent look from front to rear. The paint was taken care of by the guys at Bigcat Motorart coating the tins in a matte gun-metal grey before running a black racing stripe down the centre. 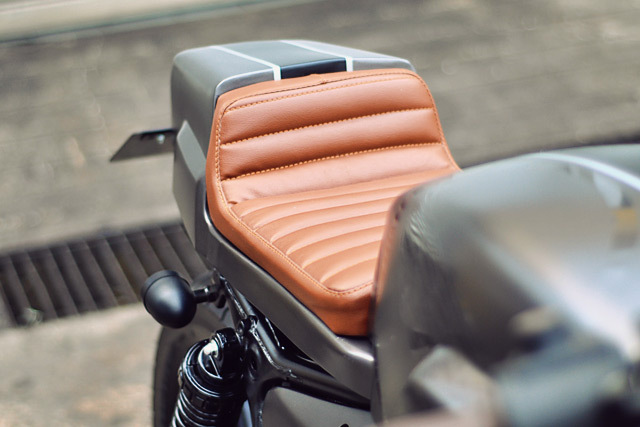 The seat is covered in a hard-wearing PVC product in a classic tan colour while the tank sports a gloss black Honda logo that almost looks like a tattoo. With the owner wanting to retain the factory airbox custom side covers were fabricated to maintain a clean look and given the Kerkus logo to finish. The front forks wear gators and have been lowered through the triple trees slightly with new rear shocks to match. At first the idea was to use clip-ons as per previous CBX builds the boys had undertaken but the riding style of the owner led to some more comfortable clubman bars complete with brown gum grips. 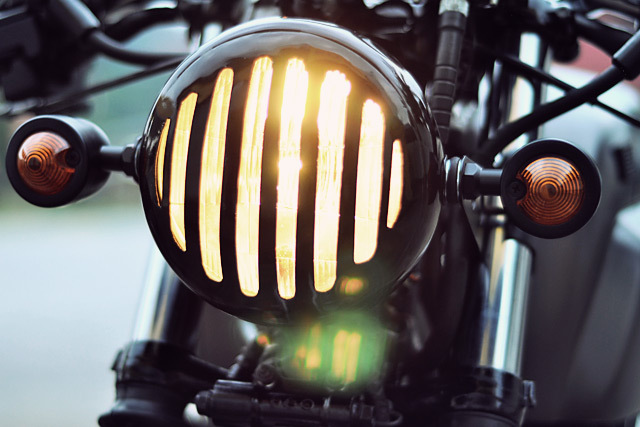 The mean and muscular look is further helped by the smaller headlight that has been powder coated black along with a Hannibal Lecter like grill. Whereas the stock machine has pieces hanging off all over the place Kerkus Cycles prefer a clean look, so bar end mirrors and bullet indicators give what is a wide machine a narrower look. Just like much of the bike the wheels have been blacked out which allows the rubber to become the more dominant feature of the rolling stock and the choice of Bridgestone Battlax BT45’s are a great mix of a tough look without compromising practicality. 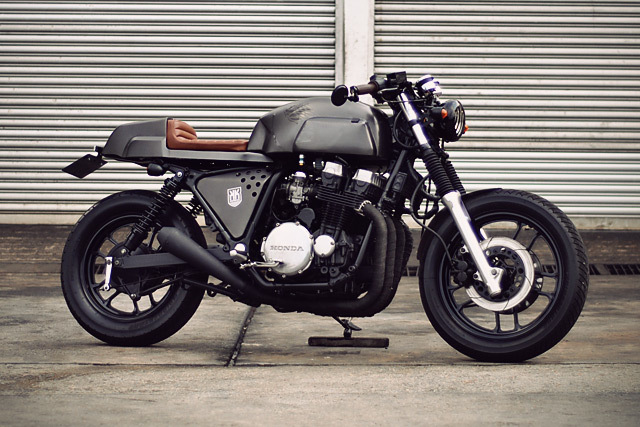 The end result is an ultra-tough looking machine that has the power and reliability to be both a practical daily rider and a weekend warrior. 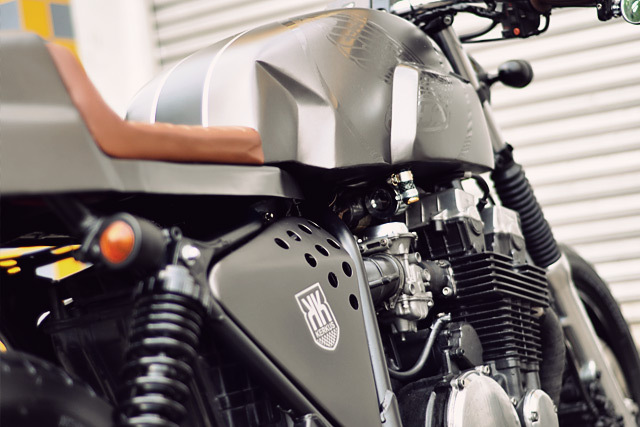 And that was exactly the aim of KL’s Kerkus Cycles, to create a muscular road monster to satisfy their customer but to also show the world that the CBX should not be overlooked; a job I think they’ve achieved in spades.